Hiking trails reviewed are found in the Rocky Mountains and the Foothills. Generally these reviews cover trails that are day hikes only. Overnight trails will be in the Backcountry Camping Section. Trails that are good for Mountain biking will be under that section. Lake trails may be under fishing section. At this time there are few trails reviewed because they fall under the other sections. As well I have been on more trails than listed but its only recently I have been taking pictures. 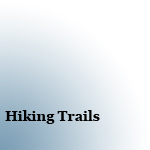 Hiking ratings are based on the overall view, condition and enjoyment of the trail. It does not include difficulty factors. Elevation and distance are rough estimates based on maps and other data.